Firstly, I am so sorry for not posting anything from the past few days. Suddenly caught the viral from somewhere and it has been the worst 3-4 days in a long time. I am still in a drugged state as I type, but before the bacteria comes attacking again in full force, I want to quickly write up this post. I had thought about this one for a long time now, had given myself the deadline that starting September, I will mend my ways…and 3 months would be a good enough time to cleanse my system and work towards achieving the bridal inner beauty excellence (whatever that might mean – basically, healthy and fit on the inside 😛 ) but the start of this month went for a total toss and now I am falling back on my plan by one full week….yikeees. So before I waste any more precious days, I want to write this post more for me than for you 🙂 as a promise to me to make myself better and try and do the right thing…health wise…atleast for the next 90 days…. i.e. Pizza Hut – I am not your friend anymore…DO NOT send pamphlets home ! Seriously ! So here are my Wedding Goals….I am calling this the practice at home detox cleansing therapy. Who wants to join me? I hate this one. The only time I even go close to fruits is when I am sick. Never otherwise. Ya ya hawww. I know. But that’s how it has always been and I know that’s majorly why I am currently on antibiotics to help me fight my flu germs 🙁 So starting now, 90 days – fruits, fruits and more fruits….apple, pear, pomegranate (eeeu, chodo not this one), ok…probably mosambi – bring it on. Itna toh for the wedding, kar hi sakte hain. My snacks used to normally be like cheese, and sandwiches and mostly bread with bournvita (I am a sucker for bournvita…like will die if that brand ever closes down)…but the thing is bournvita gives no tann ki shakti or mann ki shakti…except to may be that kid on television swimming his way to glory…its just chocolate flavored milk…but still…I will try my best to curb my urges to eat junk and instead have fruits for snacks. I never realized…life will actually come to this so soon…its making me cry almost. You know yesterday my antibiotics finally kicked in…my 103 fever went down immediately and I had this sudden burst of energy from somewhere and all I thought was can I order Ultimate Paneer Overloaded Big Pizza from Pizza Hut 🙄 Instead mumma gave a plate full of papaya. Tragedy happened. #2 Home remedies to the rescue – skin has to glow ANYHOW ! My mum has taken over this one for me. I have never been a big believer in products as such. Though sometimes they turn out to be like perfect for your skin, in most of the cases…we forever end up experimenting trying to get that perfect product for our skin, our hair or our body for that matter. Before I became sick, I already started this routine that I want to share with you all. In a matter of two days I could see the difference. Nowadays we spend so much time outside travelling, in the dust or just generally in a stressed environment, that our skin takes the worst hit. Its good to try out some of these ‘nuske‘ which are time tested…no store product can ever achieve this…guaranteed. This is the funniest one, because I tend to keep this pack on for like the whole day without bothering to wash it off. I don’t know why I always end up opening the door whenever the bell rings, and its super funny to see the looks on peoples faces. Especially guys…haha…silly me, but its quite comic at times. This paste really helps in absorbing all the oil secretions and protects the skin from outside dust particles. So, no matter how long you tend to keep it on, its perfectly fine. Its like having a protective layer over your skin. Ideal time to keep it is like 15 mins. Once it is dry just scrub and wash it off…it takes away all the dead skin cells leaving you feeling soft and fresh. Because of the citrus nature, it gives a tingling effect on the skin wherever there are germs or other living particles on your skin. Kills them all and the honey extract helps in smoothening the skin leaving it amply moisturized. Now you can forget all the cocoa butter products, this one does exactly that just better. I just keep this one on for like 15-20 mins till all the tingling sensation dies off, and then rinse it off. This has been my time tested home remedy since the time I was a kid. I always use this one. Mostly awesome to apply at night…if your skin is anything like mine which secretes a lot of oils, this perfectly absorbs it all keeping your skin dry and clean. Leave it overnight and you won’t feel chipku chipku in the mornings. Sandalwood is known for its natural wonders and no matter how many times you apply this on your face, the results are always bound to be on the positive side. I have personally got into the habit of leaving it overnight….I just hate waking up to the feeling of someone having poured paruchute oil all over my face. Its just too yukky…Give this a try…you will be surprised how pleasant and thanda you feel after applying this. My skin has a lot of open pores and with it comes a lot of oil secretion. Its like the perfect disaster combo. Although I do get acne very often, touch-wood it simply makes a short time appearance and goes without causing any permanent spots. However, since I am travelling around for work most of the time, dust and sweat are like the constant self invited guests on my skin and at times it gets very very annoying. By the end of the day, I can practically see black soot when wiping my skin clean. So given all this its super important to exfoliate and keep the skin as clean as possible. Do you guys have any other home remedies that have worked for you? I don’t know why but from the past few weeks, I stopped going down in the evenings. Instead I was watching TV shows or was out shopping or something else…and for some or the other reasons, this would always get neglected. On those particular days, I found myself super annoyed and irritated…didn’t wish to do any productive work and was more or less lazying around. Fresh air even for like 30 mins really just uplifts the mood. Its almost like a meditative state of mind where all you’re doing is absorbing everything around you without any destructive thoughts in the mind. This is definitely on my to-do list and I am going to make sure I take out some time for this. #4 How can I forget – have to learn to cook ! I love experimenting when no one is around and that’s how I know some of the basic things, all kinds of snacks, dosas and excellent gol-gol chapattis and I can even manage the fancy food…pasta, noodles, etc…But the problem is I don’t know the regular everyday food – dal, chaaval, sabzi. As the time is ticking away, I am now feeling the pressures suddenly…the fiance and I are going to be living by ourselves in Gurgaon (Oh yes, I don’t think I told you this…I am moving 😥 )…with so many changes, I think I need to be prepared with my defenses. Its almost like preparing for the ultimate war. But anyhow, I have a feeling once we are settled in our new home, with everything new and the first few months off…I will have all the time to experiment with all possible dishes…What do you think? #6 Hair worries – What to do? Do any one of you also deal with hair fall issues? I am so fed up, one of the reasons I wish to get married soon, is because I want to look good in the photos…courtesy the long lustrous hair (jo thoda abhi baccha hai) which I know at the current rate won’t last as time goes by. I know everyone keeps saying…eat healthy and the hair will show the results…probably you’re right…but it has not worked in the past. I feel agar hairfall hona hai toh hone hi vaala hai…there is nothing that one can do to stop it completely. At least I am not aware of it…so if you know some magic mantra…please please please do share. My scalp just like my skin secretes a lot of oil, which is so annoying because the day I wash my hair, by evening it becomes chaptu. No way around it – no matter what I try. And washing it daily is like impossible as it looses the natural oils and becomes static over a period of time. I feel so jealous for those who are naturally blessed with manageable hair but unfortunately I am not one of them. I really have to like work it with my hair. A couple of things I have tried is lemon with curd mix – to get rid of the dandruff and clean the scalp, also besan water mix which also has helped quite a bit. But nothing is like a permanent solution. You know what I love about being sick…I mean the only thing that I love about being sick…is to be able to have as many ORS packets as possible. Nobody stops me then. I think I am the only human who loves the taste of ORS. But since ORS cannot be like part of the diet…I have found something which is a nice substitute to have the boring water. This is something that my friend suggested long time back…its called the infused water. Have you guys tried this? Its a great option to carry to your workplace or even to simply sip at home. Just keep the infused water jug overnight and have the water the next whole day to instantly feel rejuvenated. Another thing that I am addicted to is the app water your body. This is a super cool fun app which based on your body weight suggests how many glasses of water you must intake on a daily basis. But that’s not the best part…throughout the day it will send you alarm bells asking you to stop your work for a second and sip a glass of water. What is more fun is that you need to fill in the details of how big a glass of water you finished every time you drink water bringing you closer and closer to your target throughout the day. Hey congrats on the 50th post :). I love applying besan n malai combo on my face, also curd…but i guess my skin is dry so the malai works for me, i m not sure about it on oily skin…also u could grate some dried orange peel to these packs- it does the smell away while givin u the citrus benefit :). For the hair i love love the egg mask be it with olive oil,almond oil or even parachute coconut oil – it instantly makes my hair soft n shiny. Also, i tried this banana n coconut milk paste which was wonderful- though a tad difficult to remove banana from the hair- i later realised that the banana needs to be sieved in order to not face that problem…. also oil your hair or condition it n cover it with an hot towel…. 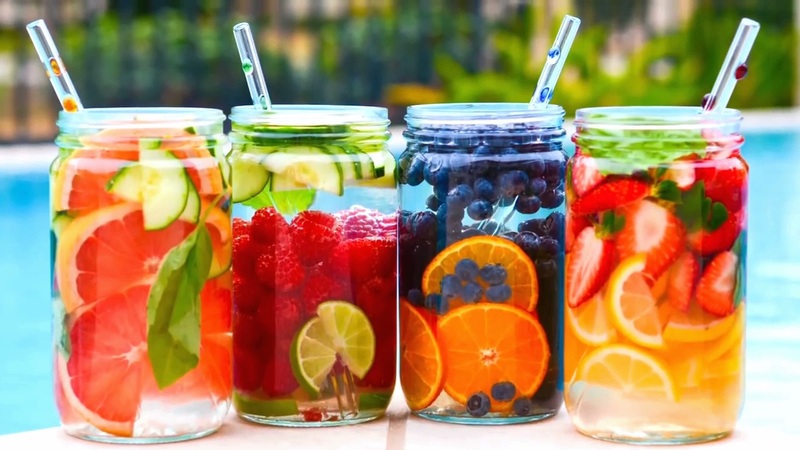 Please let me know with what all do u add to the infused water… n is infused water same as detox water? Congratulations on your impending nuptials as well as your 50th blog post! I’ve been following your blog for the past few weeks, and have enjoyed reading about your wedding prep! Regarding the hair fall, you could try using Neelibhringadi oil. I have found that it significantly reduced my hair fall. You can get the oil at any Kottakkal Arya Vaidya Sala. Thank you so much Chitra 🙂 I am glad you’re enjoying the posts ! Is that oil ayurvedic? I will ask around for Kottakkal Arya Vaidya Sala. I don’t know if its the stress or the pollution or both…but really need something to fix my mane. Thank you for suggesting 🙂 I will let you know if it works on me.